Rose Pink oca are petite tubers with a slightly irregular, cylindrical shape. The skin is thin and showcases a pale pink hue and waxy sheen. It is also lined with medium-set eyes and indentations running along the tuber. 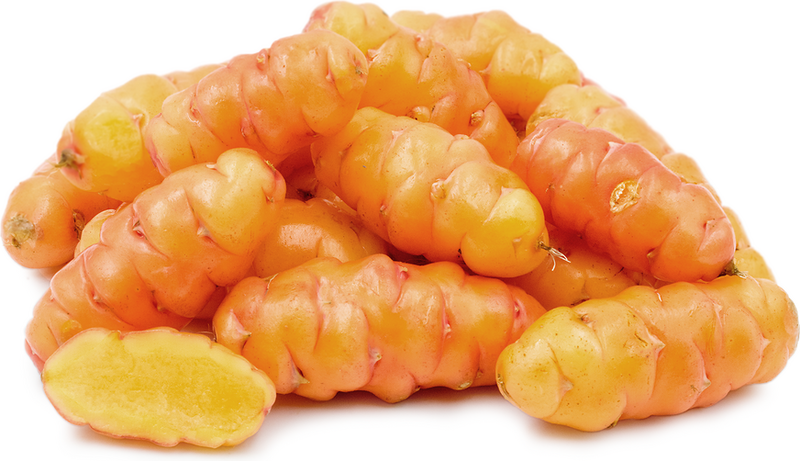 When freshly harvested, the golden flesh of the Rose Pink oca will offer a tangy and acidic taste. If it is placed in the sun for up to a week, its glucose content will nearly double, giving it a much sweeter flavor. When raw, the Rose Pink oca offers a crisp texture, but when cooked it is much softer, similar to that of cooked winter squash with sweet and nutty nuances. The leaves, shoots, and stems of the oca plant are edible as well and will lend a sharp lemon flavor. Rose Pink oca is available year-round, with peak season in the fall and spring. Rose Pink ocas, botanically classified as Oxalis tuberosa, are members of the Oxalidaceae family along with rhubarb, spinach, and sorrel. Rose Pink oca have no relation to potatoes and are classified as a part of the wood sorrel family. 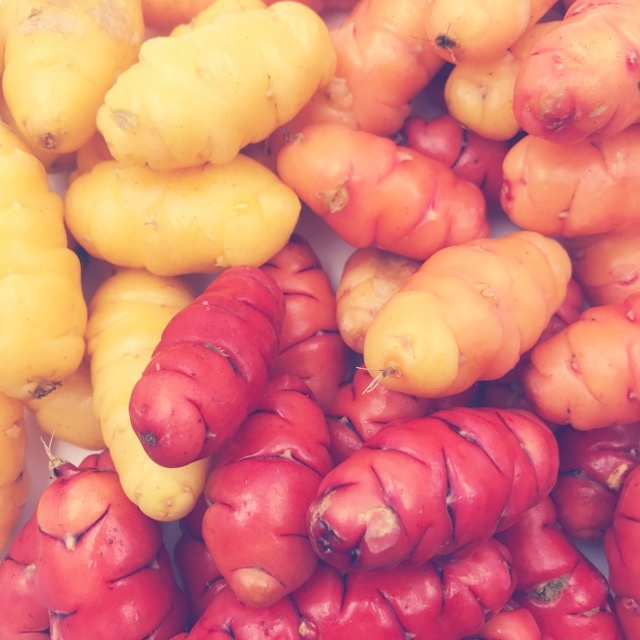 In their native home of the Andes, there are hundreds of different varieties of oca. Oca is classified according to use: sour cultivars known as khaya are thoroughly dried and processed. The sweet cultivars are known as wayk’u are set in the sun for a few days post-harvest and then typically prepared boiled or roasted. Rose Pink oca is a good source of fiber riboflavin, phosphorous, calcium, iron, amino acids and vitamin C.
Rose Pink oca is best suited for both raw or cooked applications such as sautéing, roasting, boiling, steaming, and frying. Their small size makes them ideal for use in both warm and cold salads, as a topping for flatbread or a filling for savory hand pies. Boiling or blanching the oca prior to use will help reduce the oxalic acid content and lessen its bitter flavor. Rose Pink oca will complement soups, stews, and curries. They can also be roasted or boiled and then mashed to serve alongside grilled meats and vegetables. When raw, they can be thinly sliced and added to salads and sandwiches or grated and used as a condiment to impart a sweet and sour flavor and crisp texture. Rose Pink oca pairs well with garlic, capers, cornichon pickles, Dijon mustard, rich cheeses, onions, and red meats. They will keep for a couple of weeks when stored in a cool and dark place. In the Andes, the oca is an important source of nutritional sustenance and is one of the more commonly grown types in the Vilcanota Valley of Peru today. During oca season, baked oca is popularly sold by street vendors in many Peruvian cities. In the Andes region of Bolivia, the oca is dried and ground down to make flour which is popularly used to make desserts and porridges. In Mexico, the oca is eaten raw as a snack with lemon, salt, and hot pepper. Outside of South America, New Zealand is the only country where oca tubers are widely grown. Their popularity is so extensive there that they are commonly sold under the name New Zealand yam and are traditionally served with roast lamb. The oca is believed to have originated in the Andes, specifically the highland regions between Argentina and Columbia. From there it traveled across South America and to Mexico in the 1700’s and to Europe in the 1800’s. In 1860, the oca arrived in New Zealand and quickly gained popularity, in time becoming a widely grown commercial crop.  Today it is still widely available in New Zealand, South America, Central America, and specialty grocers in the United States. Recipes that include Pink Rose Oca. One is easiest, three is harder. Someone shared Pink Rose Oca using the Specialty Produce app for iPhone and Android. Sharer's comments : Rose Pink Oca Potatoes spotted at Specialty Produce.